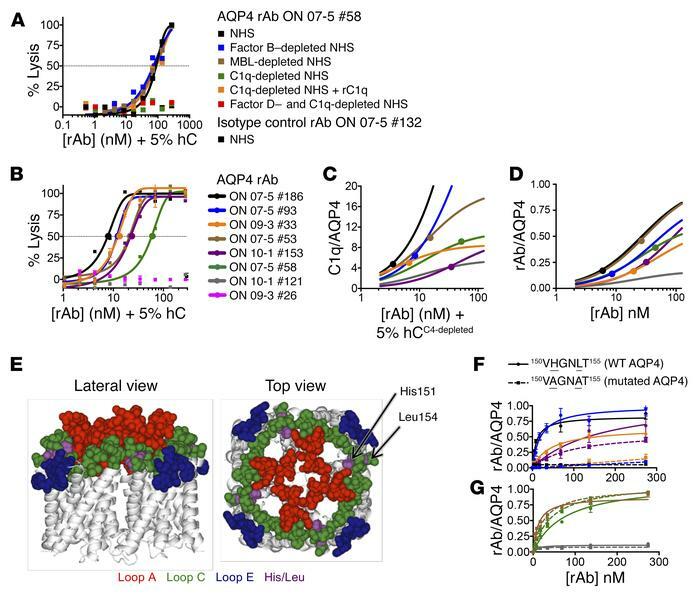 AQP4 rAb binding and classical complement activation on M23-AQP4 CHO cells. (A) CDC of M23-AQP4 CHO cells induced by AQP4 rAb ON 07-5 no. 58 or isotype control rAb ON 07-5 no. 132 was quantified using an lactate dehydrogenase (LDH) release assay (mean ± SEM; n = 4). Complete or depleted preparations of NHS were used as sources of complement proteins. Recombinant complement C1q (rC1q) was added where indicated. The dashed line indicates 50% lysis. (B) CDC induced by monoclonal AQP4 rAbs with differing epitope specificities measured using an LDH release assay (mean ± SEM; n = 4). The dashed line indicates 50% lysis. (C) The ratio of bound C1q to AQP4 is plotted against the rAb concentration. Solid circles indicate the CDC EC50 for complement activation. (D) The ratio of bound rAb to cell-surface AQP4 (rAb/AQP4) is plotted against the rAb concentration. Solid circles indicate the EC50 for CDC. (E) Lateral and top views of an AQP4 tetramer. Extracellular loops A, C, and E are colored red, green, and blue, respectively. Loop C amino acids His151 and Leu154 are colored purple; membrane-spanning and intracellular amino acids are colored gray. (F and G) Binding of AQP4 rAbs to U87MG cells expressing M23-AQP4 (solid line) or M23-AQP4H151A/L154A is shown as the ratio of bound rAb to cell-surface AQP4 (rAb/AQP4) (mean ± SEM; n = 3). Data were fitted using a single-site total binding model. hC, human complement.